One of the most graceful of costumes made from unstitched fabric-the saree-the much loved choice for most Indian women is actually worn in so many different ways, yet what unifies them all is the very beauty of the image that the draping ultimately creates. Whatever may be the region, the saree and all its parts, the body, the pallu and the border, all of them play a significant role in making the entire look happen. While the body of the saree comes with patterns, some self, some embroidered, the border and the pallu are also a significant space where the weaver’s creativity comes alive. While the pallu is called as the soul of the saree-the place here the imaginative, creative, and mathematical precision of the weavers comes into play. What does the saree border do for this garment? For anyone who has worn sarees with passion would know that it’s the most definitive feature of the saree that makes the entire saree come together as one comprehensive piece-if it were not the border, then the pallu would look completely left out of the scheme of the body. 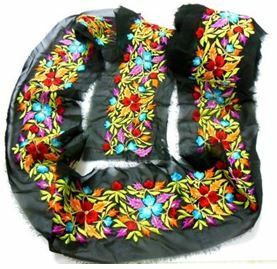 And if the pallu is varied from the body and its unique look, the merger is created by the border. Does that mean that the border has to be necessarily the moderator –no quite? As you can see in the sarees above, not only are the saree body in differing colors but they are in fact in different materials. 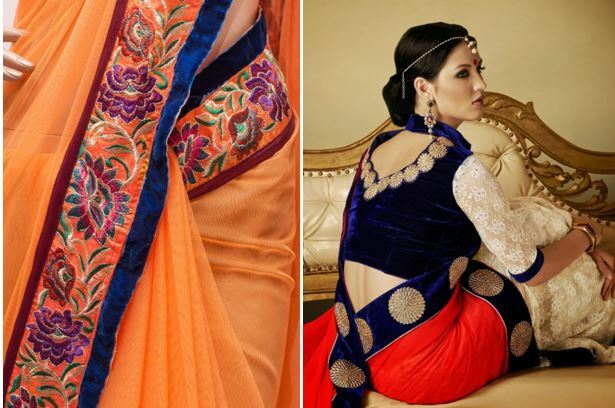 But there is one common strain that is making them look like one homogenous well designed garment, the border that runs along the edges of the saree. The splendid part of the saree is that there is never enough said about it or never enough written about it! Like a work of art, a saree is a canvas with many possibilities and the masterstroke that defines its beauty and gives it that edge is the border. Borders of course differ in the kind of craftwork they display and the width, of course their choice would depend on the choice of the wearer and the look the saree is trying to achieve. 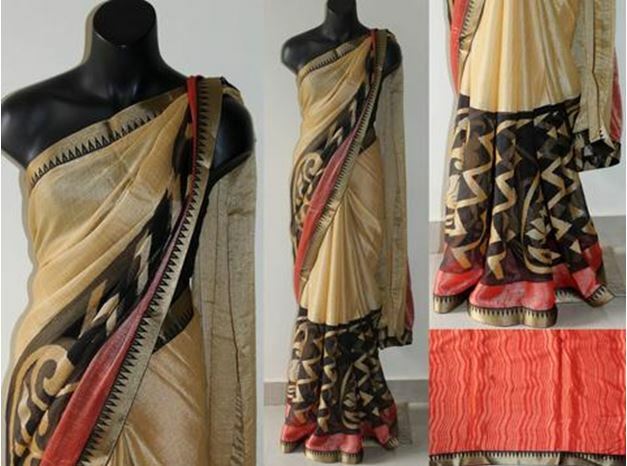 While there might be so many sarees in the market that come with self woven borders, the creativity that goes into attaching anew border to a plain saree and making it a designer piece is a different ball game altogether. 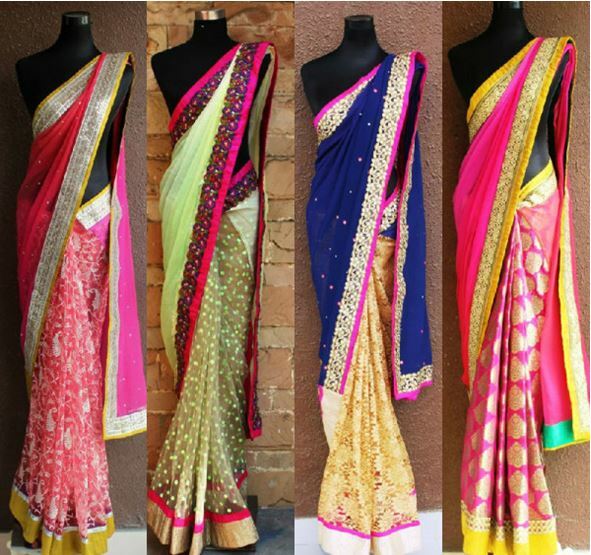 Here are my pick of some of the most definitive looks that a saree can get with the help of borders. 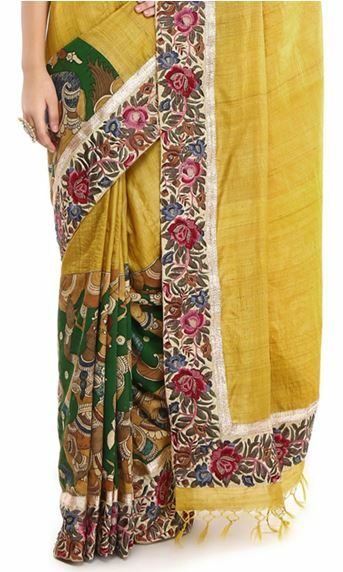 Without a doubt the most truly elegant and with such great character are the ethnic handcrafted borders that can give a plain saree the look of an absolute winner. 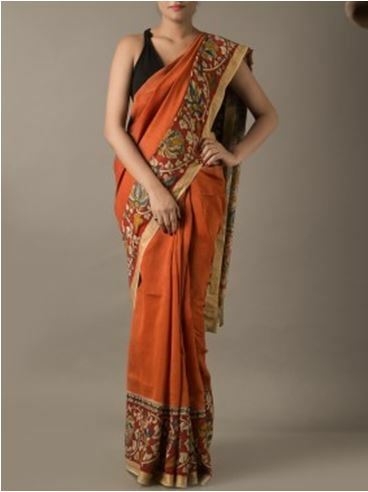 My choice this season would be the much loved pen kalamkari borders that add the elements of art to a saree. 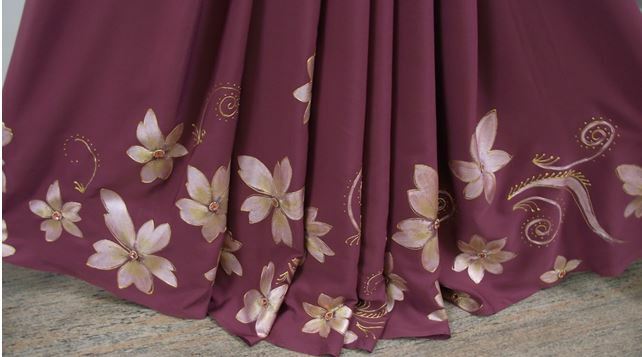 Here is simple floral border directly painted on the crepe saree. The advantage of this being that the border has been directly painted on the saree and not attached which gives the crepe its fluid style. An incredible combination of the graceful Gara border and the wider border made with kalamakari on tussar, and the one after that showcases the kalamkari on tussar once again albeit the color combination differs. One can see how the same border has been used to create a sense of continuity in the blouse as well. 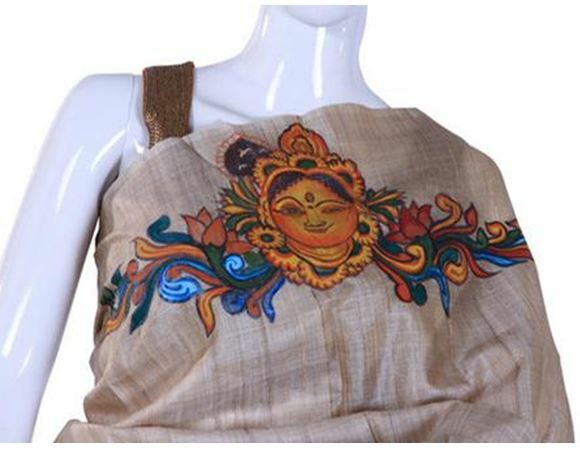 Kalamkari patchwork as well as pen kalamkari borders are easily available for one to attach them on to sarees with ease. 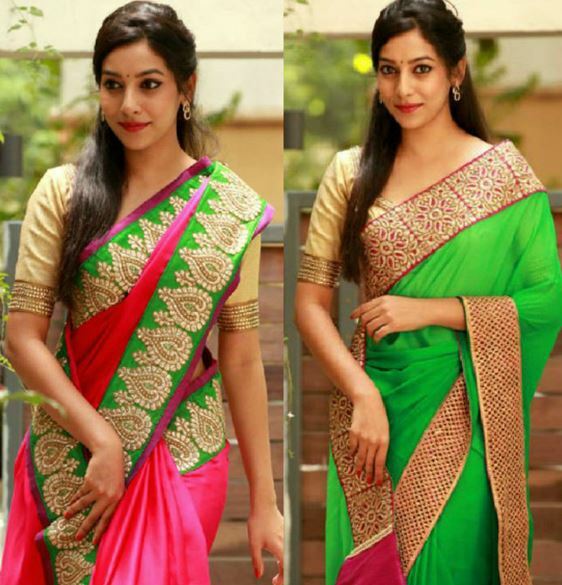 In this style of borders you can see how the see through nature of the net saree worn by the celebrity has been broken into three levels, each with a simple thin border and placed at distance but the effect that it’s creating is truly unique. The coming together of peach, yellow with golden stripes, and the Gara at the base, are all somewhere inclined to be together while at the same time each portion of the border incredibly beautiful to behold. Another style that is remarkable is not just varying design but also the width of the border that creates more drama with the look. The incredible beauty of the top border that is thinner and the bottom one that is much wider is really a remarkable contrast not juts of width but also of design. The second saree shows how embroidered border on top looks fabulous with a traditional Benarasi styled border. What is important however is the ability to make the colors come together. These traditional Benarasi borders are antique quality and some of them are revived designs from more than a couple centuries ago where kalash and parrots were considered auspicious and here one can see the ‘ambi’ and the parrot design making the muted colors come alive. 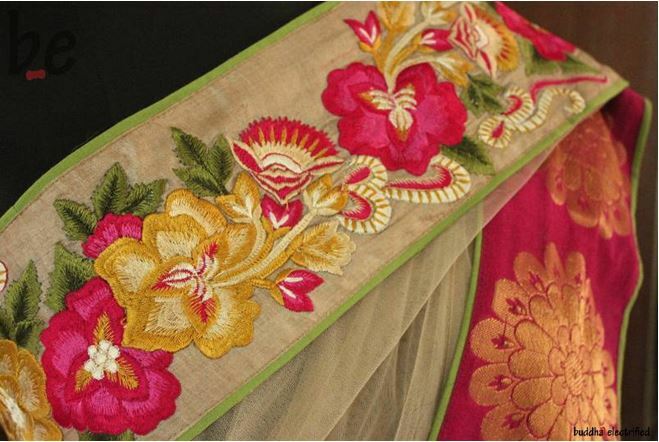 Rolls of such antique borders in resham and zari are created at Benaras. The pride of Rajasthan, the gota patti work is painstakingly created and makes for a splash of brightness most suited for weddings and grand occasions. They look fabulous ion bright colors as much as on dull ones. Could be with stone work, and silver, copper or gold gota. The merging of the richness of velvet with fabrics that are soft , and see through makes for an amazing contrast and when that comes together with embroidery, the effect is incredible. Very popular for its opulent look and feel-velvet borders end up looking very grand and are lighter than sarees that have velvet drapes. Not necessarily always very bright and gaudy –mirror work when presented with elan can be subtle and highly sophisticated. The flashiness can be reduced with usage of thread in muted shades to give it just the amount of dazzle as is needed. 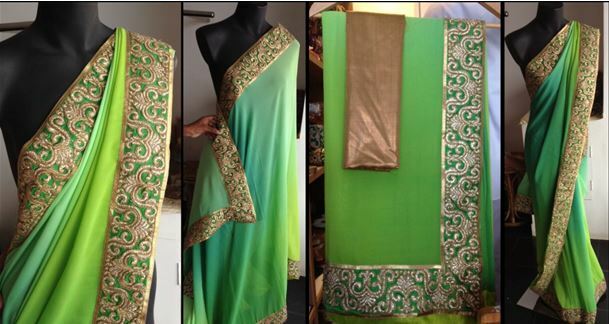 This apple green saree is a perfect example. Though Parsi Gara work is simply the most expensive of borders one can get, there are slightly cheaper versions that try and imitate the fine needle work. The usage on plain sarees takes them to quite another level. 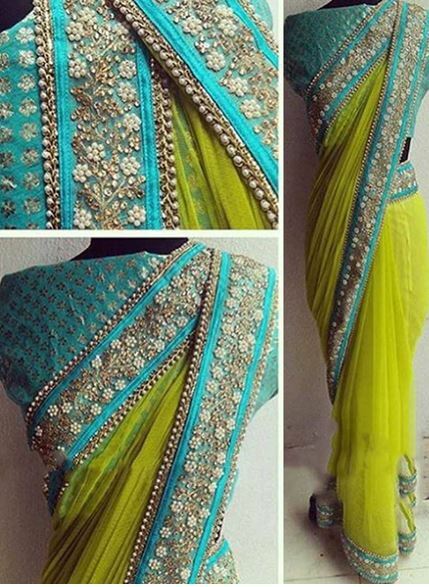 A gorgeous combination that is doing such an incredible lot for the saree here in this picture-the green net coming to a new heightened color brightness due to the inclusion of turquoise and pearl embellishment in a trim. A beautiful synchronization of shades. The beautiful golden border here has been created like an ordinary crochet border. While chiffons look incredible with handmade lace of any kind, here the twist is the usage of golden color with gota patti- another innovative usage of lace that is more ethnic than the usage of French lace. 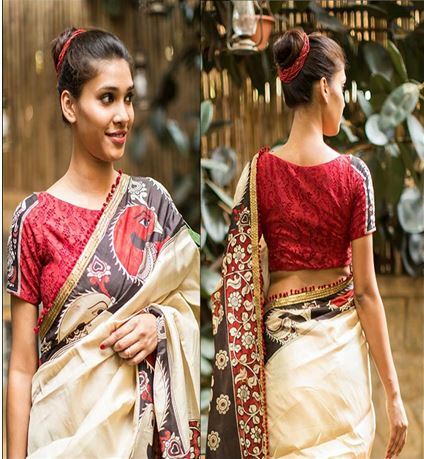 When sarees are given a new border, it’s the placement in neat manner, how the border suits the fabric of the saree and how the width and color suit the person wearing the saree which makes the impact all the more impressive. Borders truly give the wearer an edge and the more one plays with designs, textures, crafts and colors, more the chances are that the border will elevate the beauty of the saree to another level.